The Samson GB-9003, 9004, 9005, and 9006 are all the same juicer, only with a different body color for each. This allows you to pick whichever color best matches your kitchen: Ivory, white, black and chrome respectively. 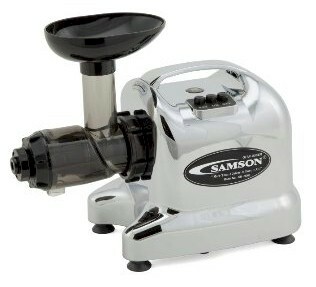 How is the Samson 6-in-1 Juicer Unique? The Samson 6-in-1 has been in the market for over ten years now. It was known by many other names and vary slightly in the make of its screw (auger) and colors, depending on where it is being marketed. In the USA, these models are making a comeback as the “New Advanced Juicers“. They feature a straining screen, mincing cone and auger made of GE’s Ultem material. A material that is eight times stronger than other plastics. There are many imitations in the market trying to imitate this solid juicer, so if you are looking to buy one, it is important that you know that you are purchasing a quality unit that doesn’t break down after a year’s use. Next to the normal centrifugal juicer, this beauty is far more excellent in the production of healthy juice yield that preserves the delicate enzymes, nutrients and minerals that generally get destroyed using the conventional method of extraction by high-speed spinning. Since using the earlier model of this juicer (known as the Matstone by another company then), I have seen my health improve significantly and would choose not to drink juices extracted from a centrifugal juicer again. Especially now that I know the harm that juices from centrifugal juicers can do to our body. I love this juicer for its high juice yield that minimizes pesticides and harmful chemicals. It is easy to assemble and dismantle. Cleaning up takes only about 2 minutes, perfect for busy people like me. How Does the Samson 6-in-1 Juicer Work? 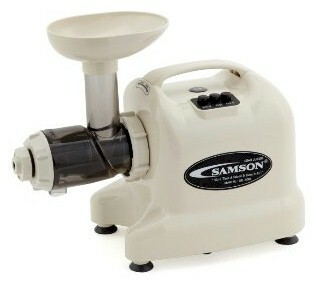 The Samson 6-in-1 juice extractor works on a stone-milling method. What this means is that it crushes and grinds the produce fed into it, squeezing out the juice and separating the dry pulp, using a ‘worm-like’ screw/auger (see picture above). This method of juice extraction tears open the produce’s cell membranes and releases its deep-seated nutrients and enzymes. This results in a richer colored juice which contains 99% of the enzymes, nutrients and minerals still intact. The juicer operates at a low RPM speed of 80, which does not disrupt the cellular structure of the fruits and vegetables. This is important as it eliminates oxidation of the juices, preserving the precious enzymes and nutrients closest to its natural form. There is a marked difference in the quality of the juices extracted from both a centrifugal and the Samson 6-in-1 juicer. For example, an apple juiced on a centrifugal juicer will produce an oxidized brown colored clear juice (only water content with no enzymes and nutrients) which has a metallic taste; whereas the apple juiced on the Samson 6-in-1 juicer will result in un-oxidized, even-colored and great-tasting juice. Oxidized juice is effectively, spoiled juice. Samson 6-in-1 GB9000 Series Juicers? The Samson Advanced series are marketed with a 6-in-1 functions. It is also called the Multipurpose Juice Extractor or even the Electric Wheatgrass Juicer. These are the official functions of what the Samson 6-in-1 is capable of doing. I personally don’t think that the functions are only limited to six. I know it can do much more! 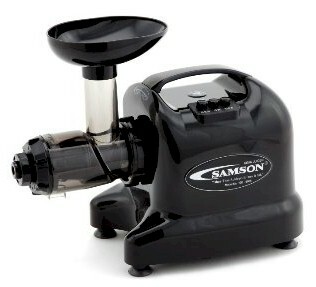 The Samson 6-in-1 juicer can easily juice any kind of fruits from soft to hard. Juicing leafy vegetables (or wheatgrass/barleygrass/alfalfa sprouts) is also a breeze using this juice extractor. This is a wonderful kitchen helper that helps to mince/chop seasonings and herbs such as garlic, onions, red peppers, ginger, radishes, basil, chilies, and even meat like beef, chicken, mutton, and fish, etc. Grind and make your own healthy and delicious peanut butter. Commercially prepared peanut butter may contain moldy peanuts that are cancer-causing. Moreover, they are made using a hydrogenation process which contains dangerous trans-fats. Make your own minus all the additives and preservatives. 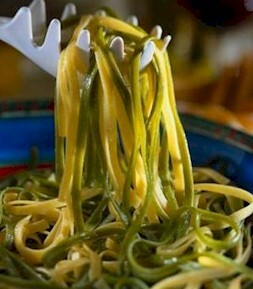 Make your own healthy homemade noodle that is free from preservatives, additives or coloring. Simply make your dough from whole-meal flour with spinach juice (for green noodles) or carrot juice (for orange noodles!). If you like egg noodles, just beat up a couple of eggs and add on to the whole-meal flour to knead and put through the Samson 6-in-1 . This model comes with four noodle nozzles—two round and two flat—of different opening sizes, and one for juicing/breadstick. 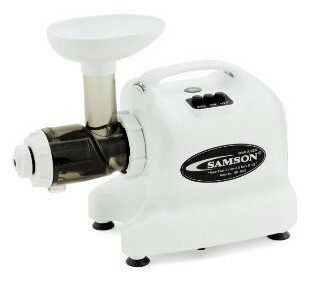 Put cooked rice or glutinous rice through your Samson 6-in-1 for fine milling. Or use beans that have been soaked overnight, to make rice cake and glutinous rice balls (“tong yuen”). If you have a toddler at home, put your healthy meal (with vegetables) through your Samson 6-in-1 to make fine food that is a nutritious meal for your child. Save your time for having to cook separately. Cut fresh fruits like bananas, kiwi fruits or strawberries and store them in a freezer for about 20-30 minutes. Then put them through your Samson 6-in-1 for a healthy and nutritious cup of ice-cream. As I said, this Samson 6-in-1 can do many more things and you’re only limited by your imagination. The Samson 6-in-1 juice extractor is very easy to use. It may look complicated if you’re new to gear juicers, but the handling is really very simple. 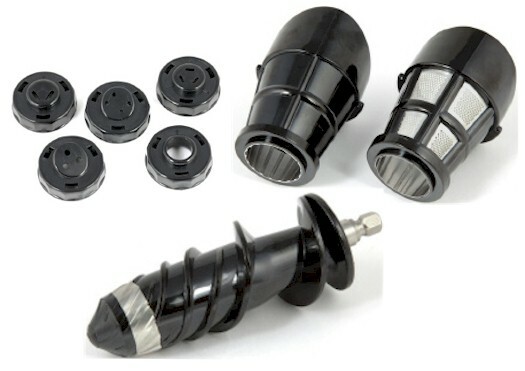 There are five different nozzles that come in the package, four for making noodles and pasta and one for juicing, or making breadstick/sorbet. There are two cones that you can use to interchange, depending on what you plan to do. Use the juicing cone for extracting juices, and the other mincing cone for most other purposes. The Samson 6-in-1 has a built-in safety device which prevents the motor from overheating. It automatically shuts off when overheated and will automatically commence operation again when cooled down. Assembling and dismantling the juicer are just six easy parts that even a child can handle the entire process with ease. Washing up after juicing is equally easy. It takes only about 2 minutes to wash up under running water—very convenient for busy people who are always on the go. Easy clean-up is a factor to consider when you are looking to purchase a juicer. If a juicer is difficult to clean up, you will soon tire of juicing. The total build-up of the juicer weighs approximately 7 kg. The heavy motor ensures that the machine is stable and steady and doesn’t “walk” when in operation. The body of the juicer is made of high quality and solid polycarbonate material that is non-toxic and easy to wash. When looking to buy a juicer, it is very important that you choose one that is easy to assemble, dismantle and wash-up. I have seen too many people given up on juicing simply because of the tedious wash-up. The Samson 6-in-1 juicer parts are very clean-cut (with no difficult-to-reach corners), thus are easy to wash. Because they are made of GE Ultem material, the parts are durable, non-toxic and easy to maintain. To attach, insert the screw into the drum, then the juicing screen, put on the drum cap and fix the appropriate nozzle. Put on the hopper to guide the fruits into the drum. Then attach to the motor and lock. Very simple.